They didn’t ever predict 404/435 races; they only analyzed 406 races they call “competitive,” getting 92.5% (in-sample) accuracy, then extrapolated to all races to get the 435 number. They’re reporting about in-sample predictions, which is really misleading to a non-scientific audience; more notes on this further below. The effect sizes and their standard errors are on the right. Being the incumbent is worth, on average, 49,000 votes, and it is much more important than all the other variables. One additional percentage point of tweet share is worth 155 votes. 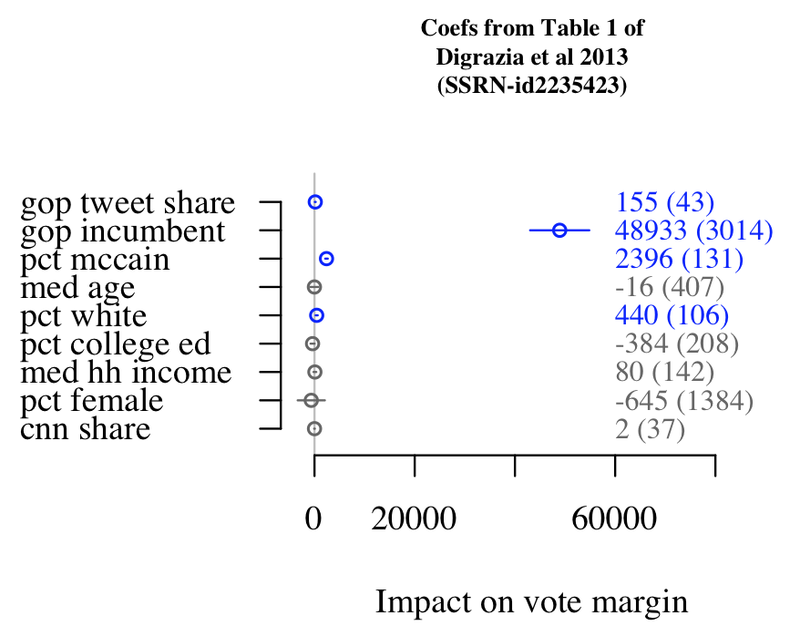 The predictive effect of tweet share is significant, but small. In the paper they point out that a standard deviation worth of tweet share margin comes out to around 5000 votes — so roughly speaking, tweet shares are 10% as important as incumbency? In the op-ed Rojas calls this a “strong correlation”; another co-author Johan Bollen called it a “strong relation.” I guess it’s a matter of opinion whether you call Figure 1 a “strong” correlation. On the other hand, tweet share is telling something that those greyed-out, non-significant demographic variables aren’t, so something interesting might be happening. The paper also has some analysis of the outliers where the model fails. Despite being clearly oversold, this is hardly the worst study of Twitter and elections; I learned something from reading it. Next, point #2 — this “prediction” analysis shares a sadly often-repeated flaw, that the so-called “predictions” are evaluated on the training data (in ML-speak), i.e. they’re in-sample predictions (in socialscience-speak). This is cheating: it’s awfully easy to predict what you’ve already seen! XKCD has a great explanation of election model overfitting. As we should know by now, the right thing to do is report accuracy on an out-of-sample, held-out test set; and the best test is to make forecasts about the future and wait to see if they turn out true. The original paper is a non-peer reviewed draft. It is in the process of being corrected, updated, and revised for publication. Many of these criticisms have already been incorporated into the current draft of the paper, which will be published within the next few months. That sounds great and I look forward to seeing the final and improved version of the paper. But, I feel like in the area of Twitter research, you have to be really cautious about your claims; they will get overblown by readers and the media otherwise. Here, the actual paper is reasonable if limited; the problem is they wrote an op-ed in a major newspaper with incredibly expansive and misleading claims about this preliminary research! This is going to bring out some justifiable criticism from the scientific community, I’m afraid. 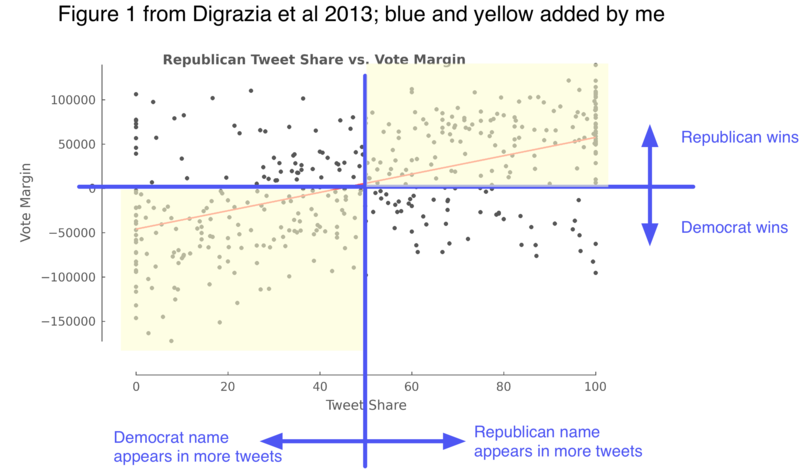 Also weird: many of the races have a 100% tweet share to one candidate. Are the counts super low, like 3-vs-0? Does it need smoothing or priors? Are these from astroturfing or spamming efforts? Do they create burstiness/overdispersion? Name mention frequency is an interesting but quite odd sort of variable that needs more analysis in the future. These aren’t literal vote counts, but number of votes normalized by district size; I think it might be interpretable as, expected number of votes in an average-sized city. Some blog posts have complained they don’t model vote share as a percentage, but I think their normalization preprocessing actually kind of handles that, albeit in a confusing/non-transparent way. I guess we could compare the variables’ standardized coefficients. Incumbency as a 0-1 indicator, for 165 Republican incumbents out of 406 total in their dataset, is stdev ~ 0.5; so I guess that’s more like, a standardized unit of tweet share is worth 20% of standardized impact of incumbency? I’m not really sure what’s the right way to compare here… I still think difference in held-out accuracy on an ablation test is the best way to tell what’s going on with one variable, if you really care about it (which is the case here). Numbers and graphics stuff I did are here.